Using compost tea in the garden is a great way to both fertilize and improve the overall health of your plants and crops. Farmers and other compost tea makers have used this fertilizing brew as a natural garden tonic for centuries, and the practice is still commonly used today. While there are several recipes available for making compost tea, there are only two basic methods that are used—passive and aerated. Passive compost tea is the most common and simplistic. This method involves soaking compost-filled “tea bags” in water for a couple of weeks. The ‘tea’ is then used as a liquid fertilizer for plants. Aerated compost tea requires additional ingredients like kelp, fish hydrolysate, and humic acid. This method also requires the use of air and/or water pumps, making it more costly to prepare. However, using this compost tea starter takes less brewing time and is often ready for application within a few days as opposed to weeks. As with the majority of recipes for making compost tea, a 5:1 ratio of water to compost is used. It takes about five parts water to one part compost. Preferably, the water should not consist of chlorine. In fact, rainwater would be even better. Chlorinated water should be allowed to sit at least 24 hours beforehand. The compost is placed in a burlap sack and suspended in a 5-gallon bucket or tub of water. This is then allowed to “steep” for a couple of weeks, stirring once every day or two. Once the brewing period is complete the bag can be removed and the liquid can be applied to plants. Depending on the size and type of system, commercial brewers are also available, especially for aerated compost tea. However, you have the option of building your own, which can be much more cost effective. A makeshift system can be put together using a 5-gallon fish tank or bucket, pump and tubing. Compost can be added straight to the water and strained later or placed in a small burlap sack or pantyhose. The liquid should be stirred a couple times each day over a two to three day period. 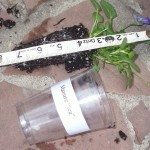 Note: It is also possible to find brewed compost tea at some garden supply centers.